All Natural Homemade Air Freshener! If you love air fresheners but don’t want an open flame in your home, this DIY Homemade air freshener may be just for you. Baking soda isn’t just good for making your fridge smell fresh! This All Natural Homemade Air Freshener actually absorbs the unpleasant odors and replaces them with your favorite scents! This project will cost you pennies to make and FILL your house with the sweet scent of your favorite essential oils. My favorite essentials oils to use are Rosemary, Lavender, and Orange. I have had this air freshener in our bathroom for a long time. You will need to recharge it once a week to keep it smelling fresh. To recharge it I simply shake the contents a few times. How To Make All Natural Homemade Air Freshener! Cut your fabric into a circle. I used the opening of my mason jar as a gauge. You will want to cut your piece of fabric a little bigger than the actual opening. This will give you enough coverage that the baking soda won’t spill out, plus it looks cute with a small ruffle. Next, add your baking soda to your jar. Filling the jar about halfway. for the small jar, it took roughly 1/2 cup of baking soda. Add in your essential oils. I used 10 drops for my small jar. For larger jars use more (about 20 drops). Place your fabric over the top of the jar and seal it with your jar ring. Give your jar a few nice shakes to incorporate the baking soda and oil. 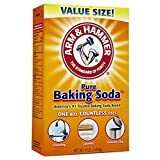 Baking soda is a natural odor absorbent and the oils give a refreshing scent to the air. If you notice that you are not smelling your air fresher remember to give it a few more quick shakes to refresh.